Flowers are a perfect choice for the ankle. Whether you choose to get one flower or multiple ones, there are so many different types of flowers that the design can really lend itself to any size and color you’d like. Roses are most common, but other flowers like daisies or hibiscus are great for ankle tattoos. You can even get a tribal version of a flower tattoo just in black for a great effect. Some flower ankle tattoos are tiny and literally on the ankle while others extend into the foot or the leg. Butterflies are a great subject matter for anywhere on the body, but because they are also small, the ankle is an ideal place for them. Butterflies can be created in any style and look beautiful! Butterflies can be mixed with stars or tribal or swirls or flowers! In addition to just being small and beautiful, butterflies are often used to symbolize a new beginning or a transition in life. Creatures that fly have always held our fascination as a species who cannot fly without mechanisms that make it possible. Because birds are often small and colorful, they are a great choice for the ankle. Bees are even tinier and can be coupled with flowers for a beautiful effect. What kind of bird is best for the ankle? Whatever bird you like best! Fantasy tattoos include things like fairies, mermaids, elves, trolls, gnomes, even dragons! Anything that is mythical or magical has a place on the ankle. Fairies are a popular one because they are known to be small, about ankle size. 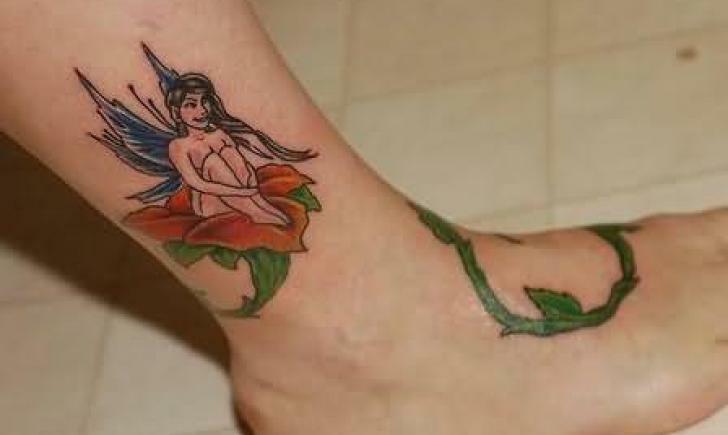 So to have a little fairy sitting there on your ankle is quite lovely! Lettering is a great tattoo for the ankle. Tattoos that are just one strong word are especially great. They are not overbearing and can have a very meaningful impact. Just look at that picture, isn’t it beautiful? Hearts or stars are perfect for the ankle and can be designed into countless designs to choose from. You can even combine hearts and stars together or mix them with other elements-really any other visual elements, and look great! Even though tribal designs are often thought to adorn muscular men, and be very large, a smaller, more feminine and elegant version can be just the right touch for the ankle, as shown in the picture above. Feathers are amazing! They have a whimsical and magical feel, but also connect to nature and the idea of being able to fly. With such an ethereal element, the feminine spot of the ankle is perfect for it! Inspired to get that ankle tattoo you’ve been dreaming about? Get it started by getting a custom tattoo design created by one of our talented artists. Post your custom tattoo design request today!